Although my favorite way to eat Nutella is slathered on bread, I thought for World Nutella Day (four years old this year, I might add!) I would combine two of my favorite things: steamed pudding and Nutella. Steamed pudding is basically a cake that is steamed rather than baked, then turned out onto a plate. What’s great is that it never gets really dry, so it’s moist and gooey, and often times light. Usually a 4-5 quart heatproof bowl is the tool of choice for steaming the pudding in. This then needs to be set inside a larger pot that can accommodate water about halfway up the sides of the bowl. Lucky for me, I have a steam oven (great for making siopao, by the way! ), so I just set a large heatproof dish with a cover directly in the oven. For traditional steaming, the pudding bowl needs to be prepared properly. These instructions from the BBC are the best I’ve seen for preparing a steamed pudding. This pudding is more like a souffle, and the Nutella taste is subtle in the light airy texture. To dress it up, you can prepare a little Nutella sauce, but I’m happy eating it with a spoonful of sweetened creme fraiche. Recipe tip: Because Nutella actually doesn’t have a lot of chocolate (or hazelnut for that matter), the taste is really subtle when you bake with it. What I have found, however, is that if you make your own gianduja (chocolate-hazelnut mixture), you really boost the intensity of chocolatey-hazelnutty flavor. There’s a great recipe at the Cook and Eat blog. Give it a shot! Grease the bowl generously with butter. In a small heavy pan, heat the cream, butter and salt over medium low. Lower the heat to low and add the Nutella. Whisk together until totally combined. Set aside until just a bit warm. Add the egg yolks to a large bowl and whisk until a bit frothy. Pour the Nutella mixture into the eggs, whisking while you add it so the eggs don’t curdle. In a separate bowl, whip the egg white with an electric mixer. When the egg whites start looking foamy, add the cream of tartar and the sugar. Whisk until stiff peaks form, but don’t let it dry out. Stir in about a quarter of the egg whites into the egg yolk and Nutella mixture. Gently fold the rest of the egg whites in with a spatula. Sprinkle on the flour and gently fold that in as well. Steam the pudding for an hour. Remove from heat and let stand for 15 minutes. This is a good time to prepare the Nutella sauce, if you are making it. Add the Nutella to a medium-sized bowl. While whisking, pour the boiling water over the Nutella. It may seize up at first, but as the water gets incorporated, it will become smooth again. Combine the creme fraiche, sugar and vanilla. Stir together until smooth. happy Nutella day to you! This warms my Nutella-loving heart! Thanks! Nutella is great with fruit — I’ll have to try apples next time. 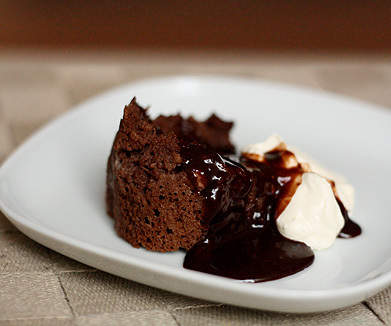 That pudding sounds lovely and light, and I love the nutella sauce! I love nutella anything but never thought ot make or had it in pudding like this before! YUM! That first picture is totally seductive – great way to celebrate Happy Nutella Day! Drooling over these! I cant wait to try them! !